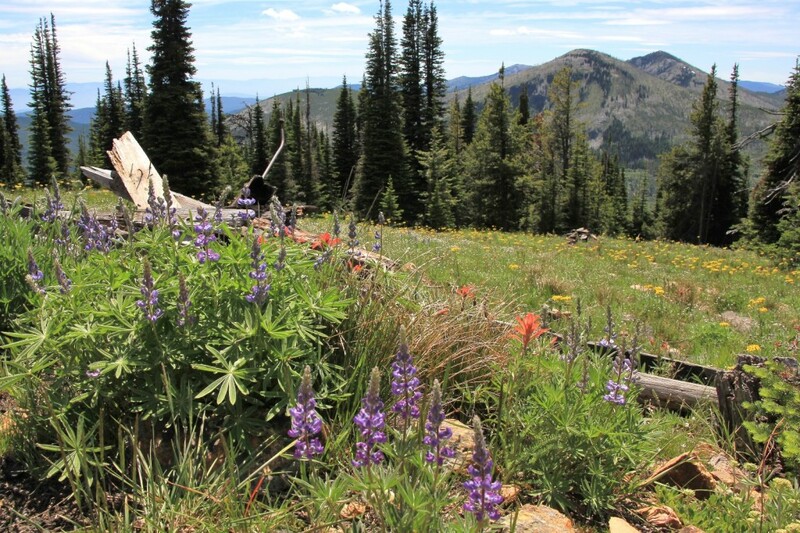 Wapaloosie Mountain: climb to one of the highest summits on Washington State’s Kettle Crest for great views and flower filled meadows. 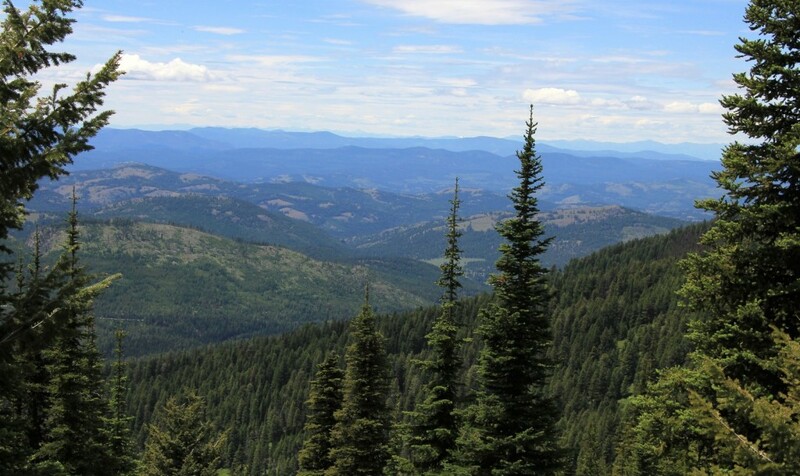 Columbia Mountain: enjoy fantastic views of Washington’s Kettle River Range on this climb to a charming 1914 lookout. The Fourth of July holiday weekend was here and temperatures had really warmed up over the past week. We looked for a mountain destination that would be cooler yet snow free. We had been pretty impressed with the Kettle Crest of northcentral Washington over Memorial Day—it was relatively close with few people and lots of trails. Predicted daytime highs were 70 degrees with nighttime lows in the 50s. Perfect! Friday morning we were on the road by 7:00. Our route took us north up US 195 to Spokane continuing north on us 395 past Loon Lake to Chewelah, Colville, and Kettle Falls. 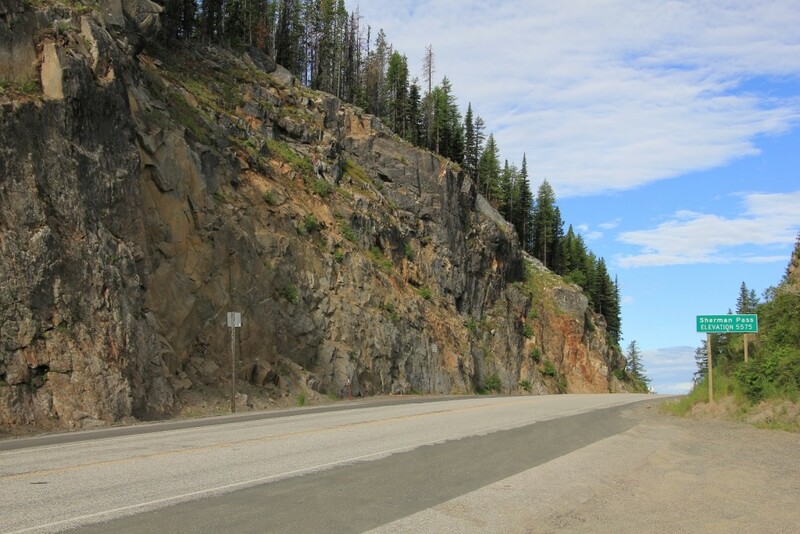 After crossing the Columbia River just west of Kettle Falls, we turned onto Sherman Pass Scenic Byway (state route 20) and continued 22 miles to Forest Road 2030 which took us 3.3 miles to the Wapaloosie Mountain trailhead, elevation 5,025’. 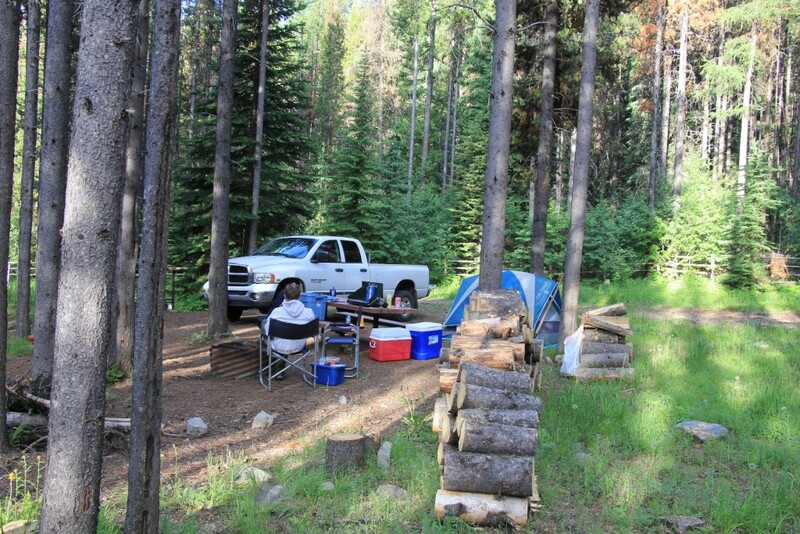 I had read that there were a few campsites at the TH and boy did we luck out. The area was off the road a little ways and was nicely shaded. There was a very clean outhouse and three spots with picnic tables. The site had recently been thinned of trees (although it was still thick with young trees) and there were piles of cut firewood stacked at each site ready for use. There was one other vehicle at the TH when we pulled in- a camper van with WA plates parked in one of the campsites. We pulled into the other prime spot and set up camp. We began our hike to Wapaloosie Mountain with temperatures around 70 degrees. Shortly after, we met the couple that belonged with the camper van. They were recent retirees from the Seattle area who were impressed with how quiet the area was. The trail begins in thick lodgepole pine forest and crosses the North Fork of Sherman Creek on a nice footbridge. 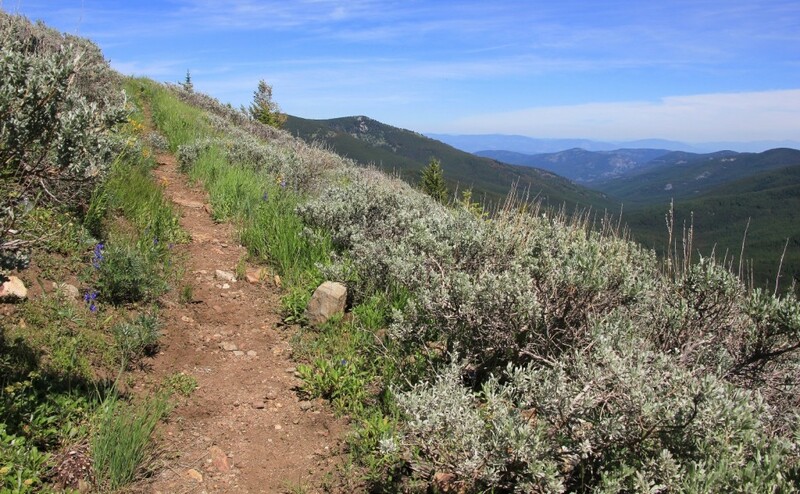 This trail means business, climbing 2,000’ in just 3.0 miles, making for a pretty steady climb most of the hike. The first mile was a viewless climb through the thick forest, but then we opened up to great views north and east. It was a sunny day, but hazy conditions limited our long range views. I’m guessing that the views north to Canada and east to the Selkirks are fantastic on a nice clear day. The climb eased a bit as we hit a series of well graded switchbacks. 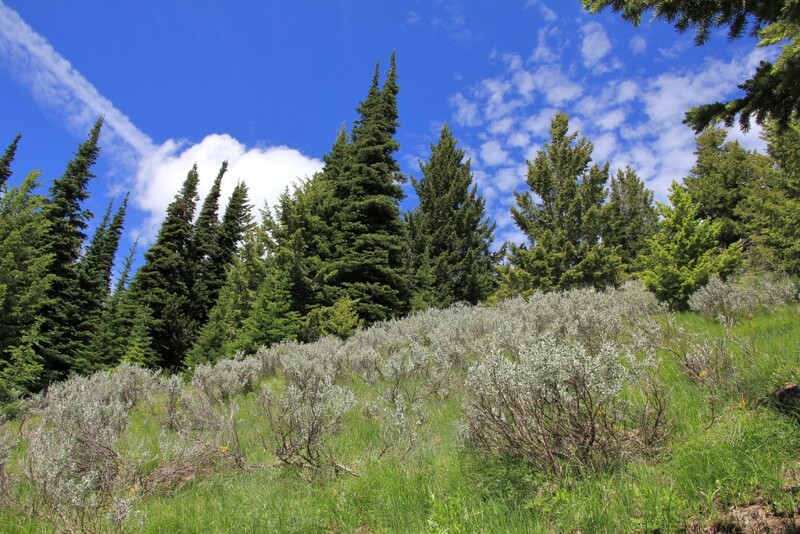 Crossing the open hillside of Wapaloosie, we walked through vast fields of lupine and paintbrush in peak bloom. At 2.7 miles, we joined the Kettle Crest Trail. From here we went off trail northeast approximately 0.25 miles to reach the summit of Wapaloosie Mountain (elevation 7,018’) where we found the big rock cairn that our guidebook had mentioned. We enjoyed the views and a Snickers bar. We made it back to camp around 5:00 and kicked back with drinks and a campfire for a little relaxation before dinner. The couple from the camper van came over and we enjoyed a long visit—each couple telling stories of their favorite places to hike. It was nice having good people camped nearby and being in such a quiet location on the 4th of July. There would be no loud fireworks for us this year, just the quiet gurgle of the creek behind us. Saturday we got up around 5:30 and enjoyed a leisurely cup of drip coffee and breakfast. On tap for the day, exacting our revenge on Columbia Mountain. We had tried Columbia back over Memorial Day and had fallen short of our goal due to snow drifts. 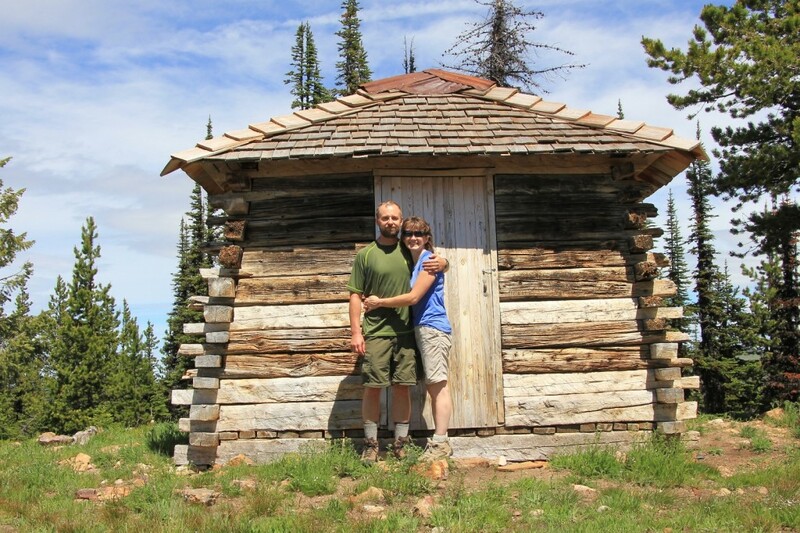 We made the short drive from camp up to Sherman Pass and pulled into the Kettle Crest trailhead at 5,500’ elevation. There were quite a few cars, but parking was not a problem. 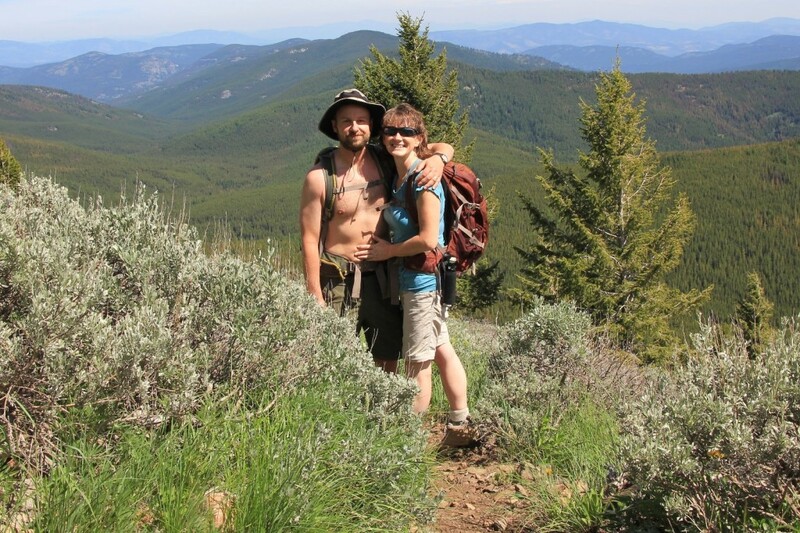 We headed north on the Kettle Crest National Recreation Trail which follows the spine of the Kettle River Range—transition range between the Cascades to the west and the Rockies to the east. 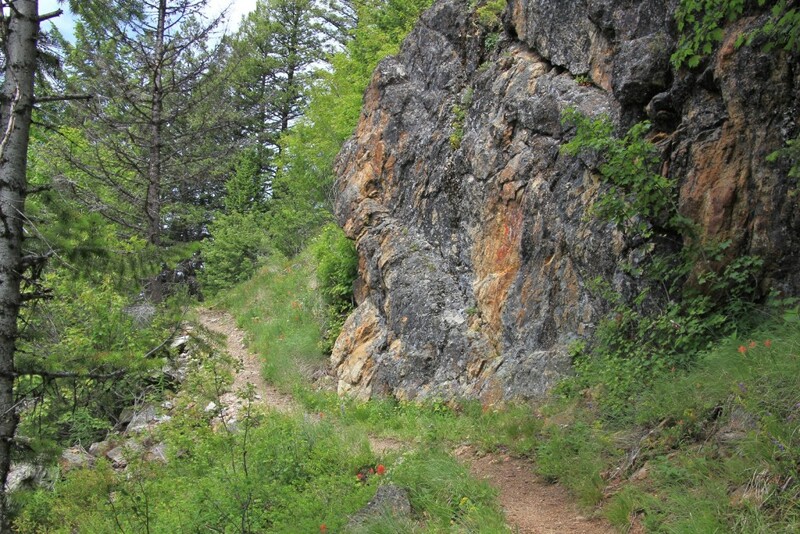 The trail makes a gentle climb through the forest and past a couple granite ledge ledges. Glimpses of the byway appeared below. 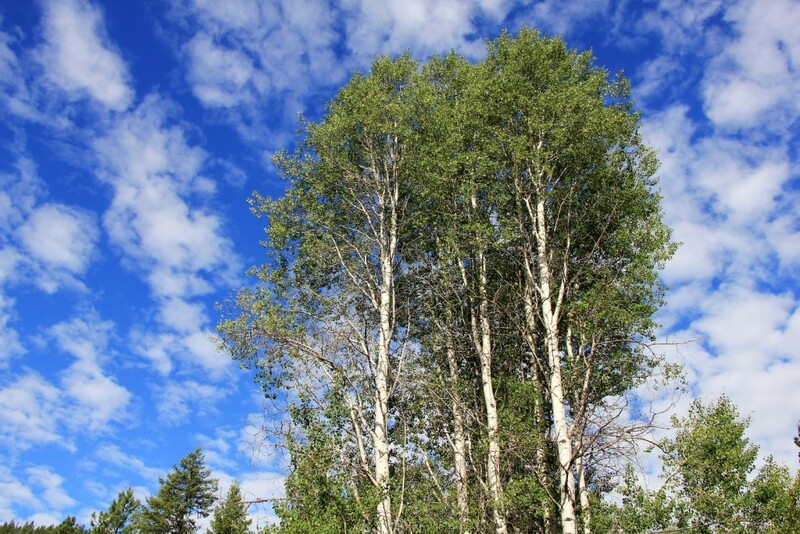 One of my favorite areas is where the trail wanders through an aspen grove. I’d love to do this stretch sometime in the fall. At 2.4 miles we reached the well-signed spur trail for Columbia Mountain to the right. Up the spur trail a short distance was a spring that flowed heavy in May but was now more of a trickle. 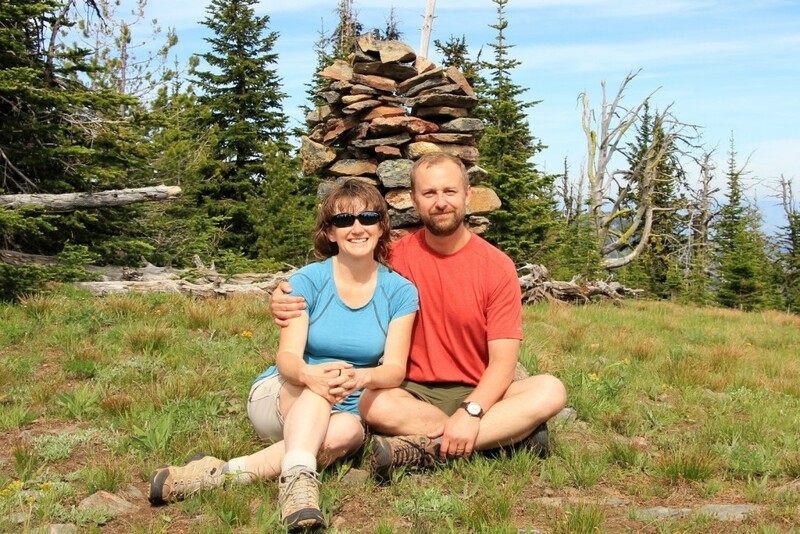 After a 0.6 mile climb we came the Columbia Mountain Loop trail which allows hikers to circle the mountain. We turned left, went about 0.25 miles then turned right onto the spur trail up to Columbia Mountain. We reached the lookout after about another 0.3 miles of climbing. Columbia Mountain Lookout at 6,782’ elevation was built in 1914 and is listed on the National Historic Register. 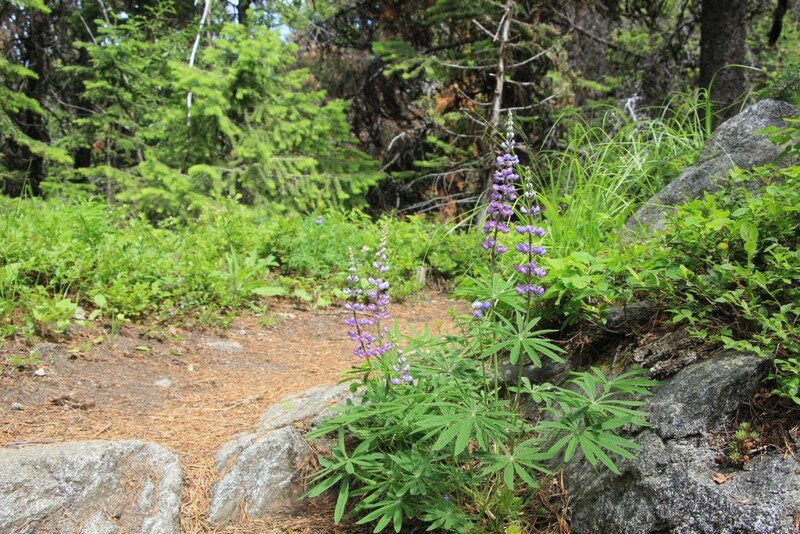 We may have missed a 4th of July show the night before, but the lupines and paintbrush put on a colorful explosion of their own. Views were fantastic in all directions, especially Sherman and Snow Peaks to the south. We enjoyed having the place to ourselves— we had seen a group of mountain bikers near the trailhead and two hikers at the spring, but we wouldn’t see anyone else on this holiday weekend Saturday. There were nice benches around a fire pit so we sat for quite a while and enjoyed the beautiful weather and silence of the mountain top. We dropped back down to the loop trail and took a right to make the circle around Columbia Mountain. I had heard the views were good and we were not disappointed. This stretch of trail was our favorite of the weekend. I was glad that we did this hike, even though a good portion of it was a repeat. Our guidebook claimed this was an 8.0 mile hike, but we clocked it at 7.5 miles. We returned to our truck and made the 20 minute drive down to the small town of Republic. Our first stop was the grocery store for water and ice. I asked the checker who had the best burgers in town and she quickly replied “Freckles.” She said prices were a little high, but that you get a ton of food and wouldn’t go away hungry. Freckles Gourmet BBQ was just a block walk down from the grocery store. They were moderately busy, so we chose a table in the back. They had a lot of nice wildlife and scenery prints on the wall which classed the old building up. Jason ordered the Oink and Moo burger and the $2 bottle of beer special while I went for the bacon and blue cheese burger. The burgers were huge and probably the best we’d ever had. 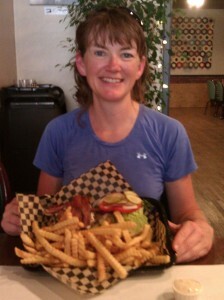 Both were served with a mountain of crinkle cut fries and their house made fry sauce that was also as good as we’ve had. We talked with the extremely friendly and outgoing cook who told us the beef is locally raised and made into hand pressed patties while the buns are baked fresh daily at the local bakery. All of the vegetables were fresh and of good quality. Everything tasted exceptionally fresh. Jason’s had bacon and pulled pork which he said was really good while mine had a good size serving of bacon and yummy blue cheese crumbles. As starving as we were from the day of hiking, neither of us could eat our entire plate. We were absolutely stuffed by the time we left Freckles. We got back up to camp by early evening and sat around a nice fire for a couple hours. Our Seattle friends had moved on and we had the place entirely to ourselves that night. Sunday morning we were up and headed for home early so that we’d have time to stop at a few historical sites on the east side of Sherman Pass. 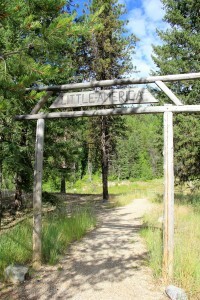 First we visited a roadside interpretative area dedicated to the Little America CCC camp that had worked there at old Sherman Lake. My Grandpa was a “CCC boy”, so I have a special interest in that piece of history. Best stimulus package in American history if you ask me. 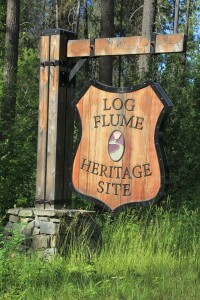 Next we stopped and hiked the short loop around the Log Flume interpretative site which chronicles the area’s rich logging history. 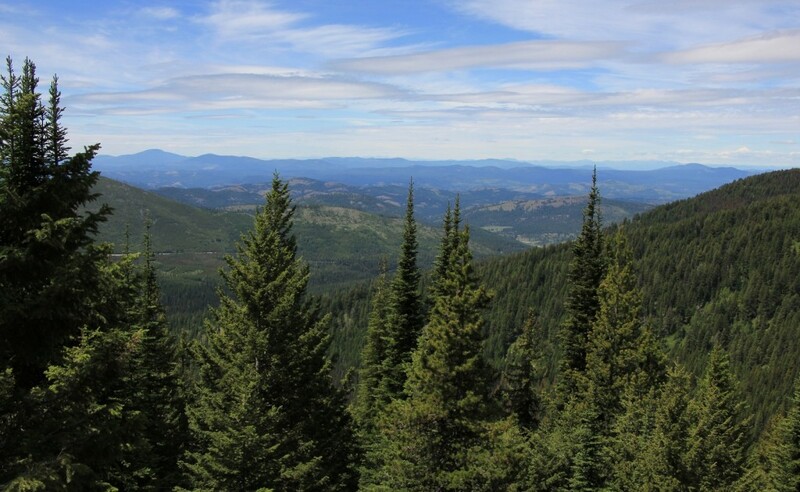 Directions to Wapaloosie Mountain trailhead: From Kettle Falls, WA, head west on state route 20 for 22 miles. Turn right onto Forest Road 2030 and drive 3.3 miles to the trailhead and small campground. 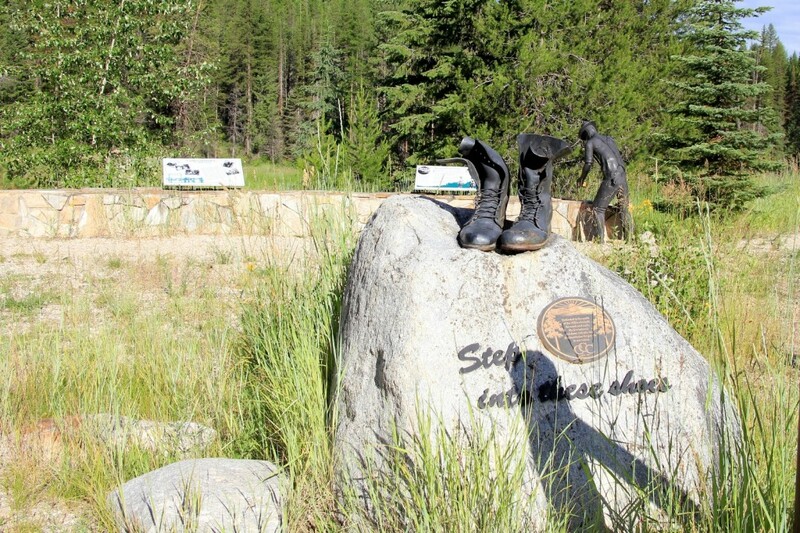 Directions to Columbia Mountain trailhead: From Kettle Falls, WA, head west on state route 20 for 26 miles to Sherman Pass. Turn right and follow the access road 0.1 mile to the Kettle Crest trailhead.